Organic, fresh, and ready-to-eat meals delivered nationwide. Pause or cancel anytime. We source locally-grown, organic, whole-food ingredients jam-packed with enticing natural flavors and all the nutrients you need to thrive. Our professional chefs craft a mouth-watering weekly menu from scratch, inspired by diverse international cuisines and approved by dietitians. Your delicious dishes are packed into eco-friendly, oven and microwave-safe containers and shipped free to your home or office each week. We deliver nationwide. Store your freshly cooked meals in the fridge and enjoy having incredible tasting food on hand to nourish your body any time of the day. Fresh n’ Lean is a ready-to-eat meal prep delivery service with a twist. We believe everyone has the right to enjoy a healthy lifestyle full of nutritious food. This is why all of our flavorful, pre-portioned meals are organic, gluten-free, and completely fresh. Our culinary masterpieces are made entirely from scratch and delivered straight to your door. Healthy eating has never been so easy! Every Fresh n’ Lean premade meal is handcrafted using the highest quality organic ingredients. Everything is locally-grown, in-season and packed with tasty goodness to optimize your wellbeing and performance. Whether you want to lose weight or simply live a healthier lifestyle, every dish in our meal subscription is dietitian-approved, with all the protein, healthy fats, complex carbs & micronutrients your body needs. No processed ingredients, refined sugars, artificial colors, flavors or stabilizers in sight. Instead, you’ll find delicious whole foods in each of our ready-to-eat meals – brimming with mouth-watering natural flavor and leaving you feeling 110%. Our talented team of professional chefs put together a changing weekly menu of breakfast, lunch and dinner options inspired by cuisines from across the globe to satisfy your inner foodie. Mediterranean, Asian, Continental and beyond! Choose the perfect plan to conquer your goals. 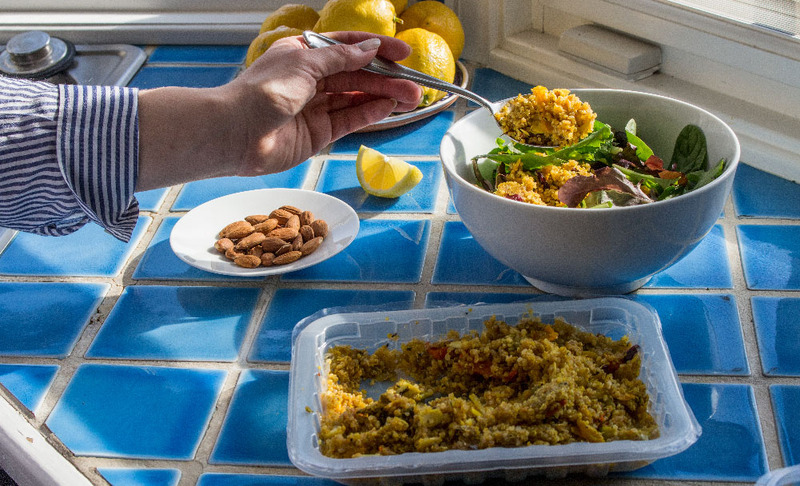 The Fresh n’ Lean vegan meal delivery plans are 100% plant-based and organic. As well as being great-tasting, every dish is packed with all the nutrition you could possibly need to thrive on a plant-based diet and enjoy a healthy, active lifestyle. Our Performance meal prep service is based around the same principles of using whole, natural ingredients, only with added high-quality, animal products in the mix (like grass-fed beef and wild-caught fish). The ideal choice for omnivorous-athletes and weekend-warriors looking to maximize performance and recovery. Whether you’re looking to lose a little weight, reduce your carb intake, supercharge your performance or just look and feel healthier – we have a wide range of meal prep delivery options to suit your individual needs! From our premium Paleo meal delivery plan to fully vegan options. Rest assured that each and every menu is filled with delicious, nutrient-dense prepared meals delivered to your door. Healthy Meal Prep Delivery, Made Easy. One of the biggest challenges people face when trying to boost their health and immunity and improve longevity is finding convenient, quick food that not only tastes great, but is packed with nutritional goodness. We start by sourcing high-quality, locally-grown, in-season organic produce. Think fresh fruits and veggies, protein-packed legumes and grass-fed meats. You’ll recognize every ingredient on the label. Each meal is nutritionally-designed to support a healthy, active lifestyle. Whole foods are naturally nutrient-dense, meaning they’re packed with all the vitamins & minerals you need without excess calories, sugars or fats. This can help you lose weight in a healthier, more natural way while making sure you never go hungry. Kale, berries, ancient grains…These are just some of the incredible, phytonutrient-rich superfoods we use to supercharge your meals, skyrocket your performance and balance your energy levels. Clean eating at its finest. The best part? Nutritious, quick meals can be delicious. Instead of using artificial flavors or processed ingredients, our professional chefs infuse their dishes with fresh herbs & spices which are packed with inflammation-fighting, immunity-boosting antioxidants. Healthy eating has never tasted so good. Between work deadlines and family commitments, healthy eating can be a huge challenge for many of us. Grocery shopping, planning, meal preparation and cleanup all take precious time and energy that most of us just don’t have at the end of the day. That’s why so many people settle for takeout or unhealthy ready-cooked meals. At Fresh n’ Lean, our home food delivery service does all the hard work for you, so you can sit back, be free, and savour the things that mean the most to you in life. Order online from our flexible, pre-made weekly subscription meal plans, or pick and choose from our varying à la carte menu. Whatever suits you best! 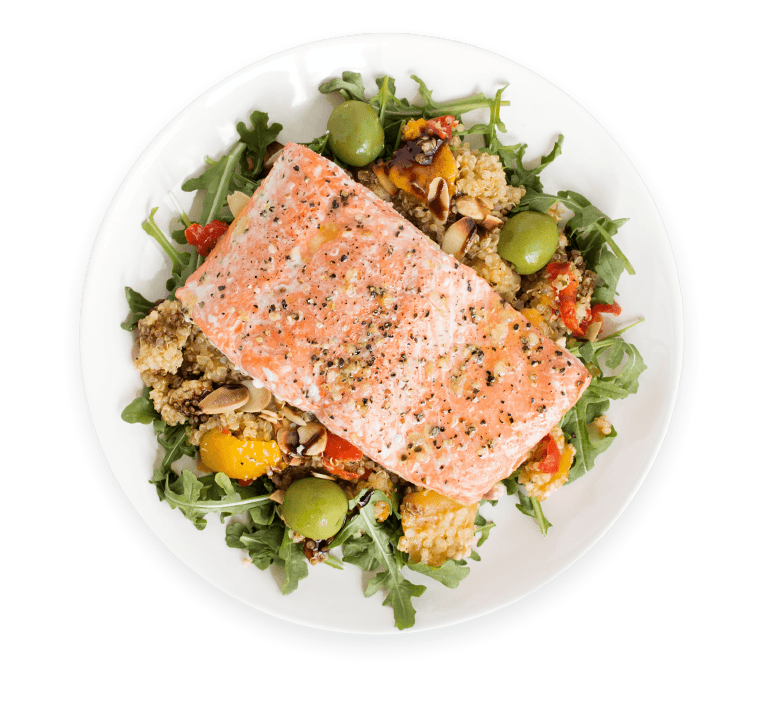 Select whether you’d like your delicious chef-prepared meals shipped to your home or dropped off at the office. You choose, we deliver (always fresh & never frozen). Our standard meal plans average out at just $9 per meal. We also use fully-recyclable packaging & locally-sourced ingredients to cut our carbon footprint. Our pre-made meals are perfect for you to grab-and-go if you’re short on time, or to dine in and savour from the comfort of your own home. Fresh n’ Lean prepares and delivers organic, gluten-free, and fresh meals directly to your door, nationwide. Unlike meal kit delivery services which require cooking and cleaning, our meals are delivered ready to eat in 3 minutes. Our goal is to make healthy eating simple and fun, without skimping on flavor. Have a question about our meal delivery service? Here are the answers to our most frequently asked questions. Where and when do you deliver? Do I have to be home to accept the delivery? Our meal delivery service operates anywhere nationwide, Wednesday through Friday. Like to travel or eat at the office? No problem. We can ship to your home, workplace, or hotel. You’ll get your fully prepared meals delivered fresh to your door during business hours, and the great news is that you don’t have to be home to accept the delivery. And don’t fret – we make sure to line our insulated delivery boxes with ice packs to keep your food fresh. So when you get in, all you have to do is place your pre-made meals in the refrigerator and put your packaging in the recycling bin. Easy-peasy! Are your pre-made meals frozen? How long will they last? Nope – everything included in our meal delivery service is made from scratch, delivered fresh and never frozen. We store your pre-made meals for the week in insulated, refrigerated delivery boxes alongside ice packs to keep everything cool and fresh during transport. When you receive your food delivery box, simply place your ready-to-eat meals directly in the refrigerator. Whenever you feel peckish, all you have to do is heat and eat! The dishes will stay fresh in the refrigerator for up to 10 days after arrival, but always check the “Enjoy By” date. Does your meal prep service accommodate specific diets or allergies? You bet! We accommodate for a wide range of dietary preferences in our meal delivery plans including vegan, paleo, low-carb, and high-protein. In fact, our entire menu is free from dairy and our facility is completely gluten-free to limit cross-contamination. Is there any cooking involved? And are your meals pre-portioned? Nope, there is no cooking required with Fresh n’ Lean. Some meal prep companies send meal kits that require cooking and cleaning, but with us, you get complete meals delivered to your home ready to enjoy at your own convenience. We take care of all the hassle – shopping, meal preparation, and clean up – so you have more free time to be with your family and live life to the full. For your convenience, all of our dishes come pre-portioned. And for those of you who want to know exactly what you’re putting into your body each day, we include a full ingredients list and nutritional data on the packaging as standard. Where are your cooked meals prepared? Our nutritious mail order meals are prepared in our big gluten-free certified kitchen (over 50,000-square feet) in Anaheim, CA. Our equipment is perfect for small, home-cooked style batch production while still allowing us to make fresh home delivered meals for a large number of wellness-warriors across the country. What am I committing to with a meal subscription? Can I place a one-time order? At Fresh n’ Lean, we want it to be as easy as possible for you to have complete control over your orders and your account at all times. That means you can skip, pause or cancel your meal delivery subscription at any time. When you sign up to Fresh n’ Lean, you’ll receive fresh meals delivered on the weekday of your choosing, and billing occurs on a weekly basis. If for any reason you need to skip a week, amend your order, change the number of meals or alter your delivery address, you can do so any time up to three weeks in advance (as long as it’s before the weekly shipping deadline). You can also choose to place a one-time order (no subscription) by selecting meals from our weekly A La Carte menu. What is Fresh n' Lean exactly? We’re a weekly subscription meal prep delivery service that ships organic and fresh (never frozen) pre-made meals to people all across the nation. Our mission is to serve goodness – helping busy parents save time, entrepreneurs take back their health and providing a nutritious fitness food delivery service too. Each dish is developed by our team of professional chefs and nutritionists. Everything is fully cooked so all you have to do is heat and eat — ready in just 3 minutes! So no more worrying about what to have for breakfast, lunch or dinner. No more having to shop for ingredients or spend hours on cleanup. And no more having to rely on processed foods and artificial ingredients to get you through the day. Instead, you can enjoy healthy, delicious meals that taste as great as they make you feel!